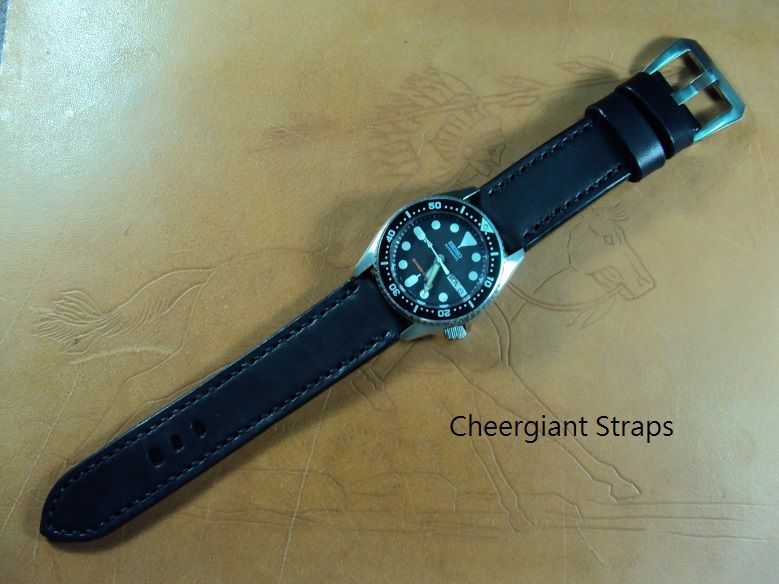 Here are some Cheergiant custom leather straps of various brand watches Svw700~707 include ORIS Awiss Hunter Team,RADO DIASTAR,Rolex,SEIKO SCUBA DIVER'S,Bell & Ross BR-03,Cartier. 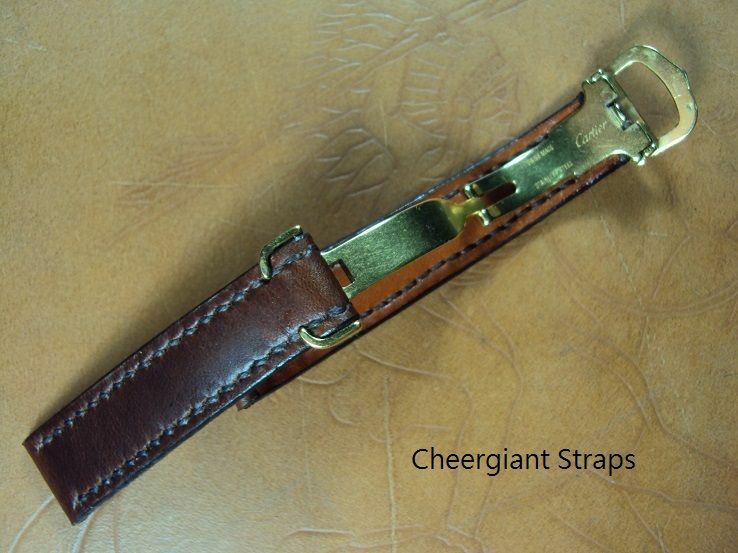 Each my posting straps could be made a new custom strap according to the specification of the custom strap order. 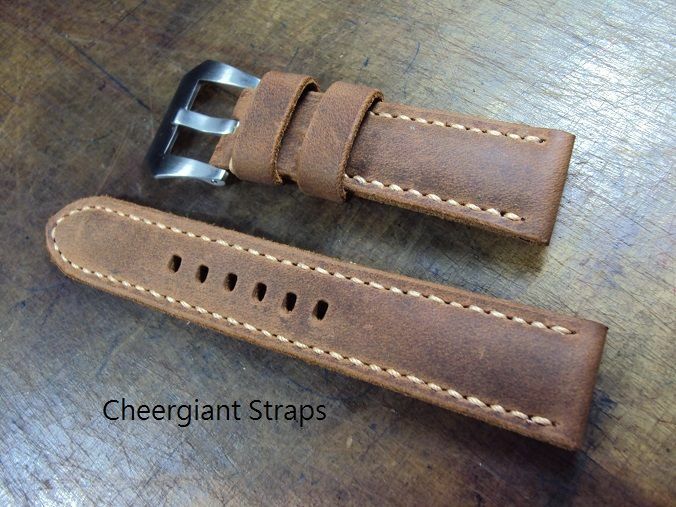 For ordering the new custom strap, we only need the widths of the strap at both the watch lug end and the buckle end, and the length of both the short end strap and the long end strap (or your wrist size). 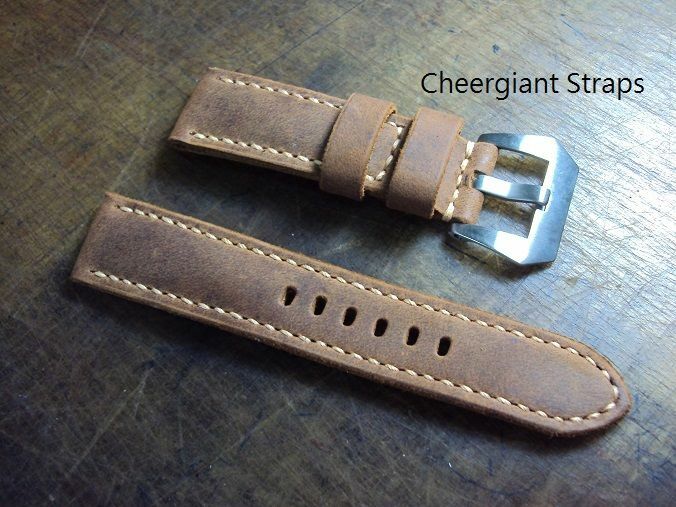 You are welcome to contact me via email to order a custom made watch strap for your own any brand of watch. 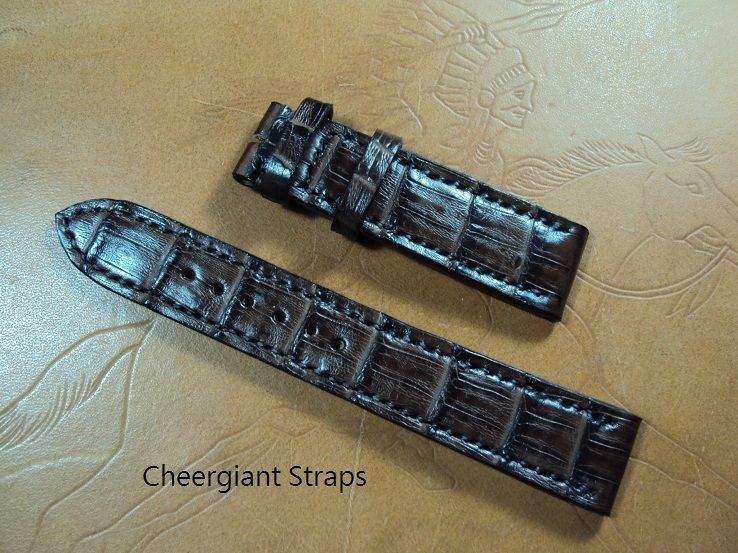 Please take a look at these strap samples below. 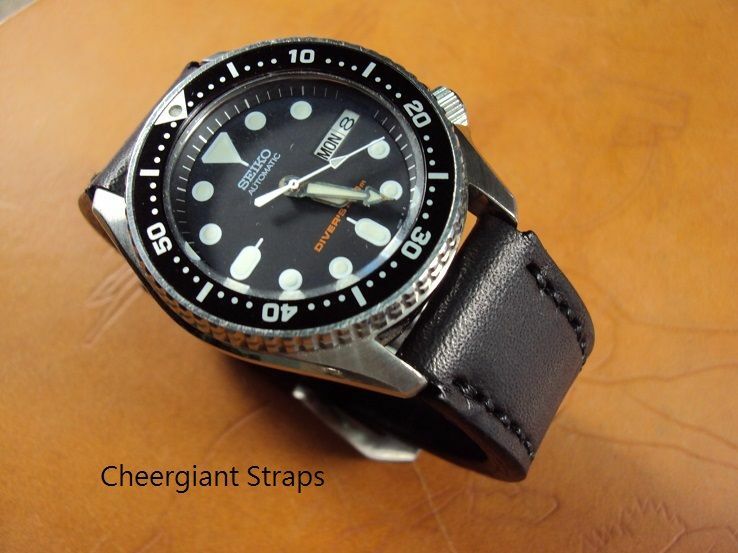 Svw700, ORIS Awiss Hunter Team padded brown crazy horse leather strap, 22x20mm, 75x125mm, thick 4.5mm taper to 3.0mm, cream stitch. 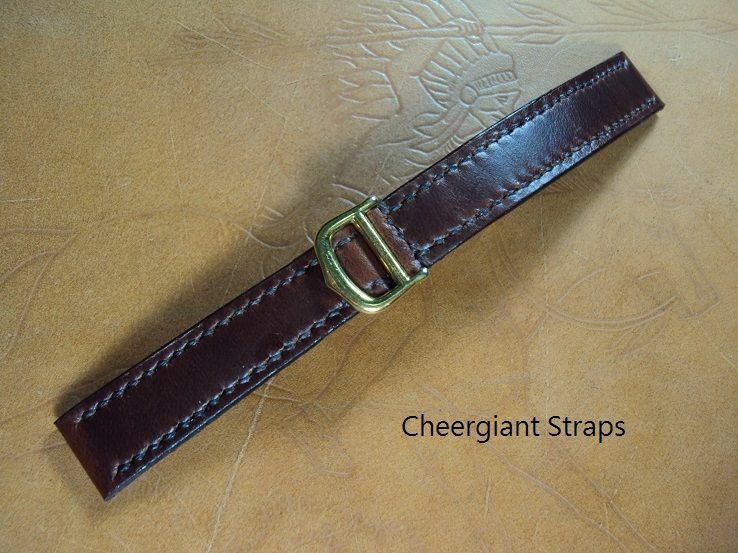 The padded leather strap is one of the most difficult hand made leather straps. 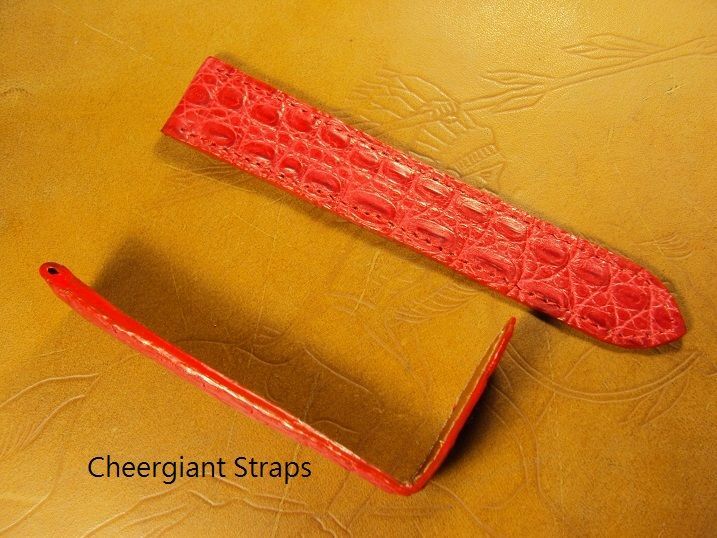 The middle layer of all most of the current OEM padded leather straps were made of some paper board pad. 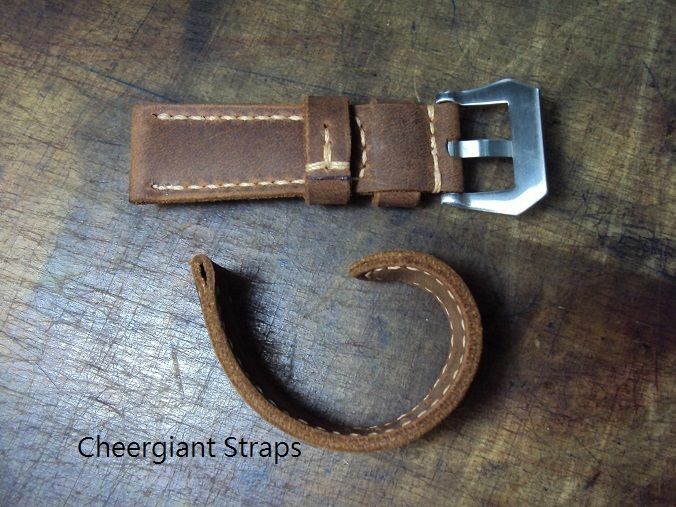 But the middle layer of our padded leather strap was made of genuine leather board pad. 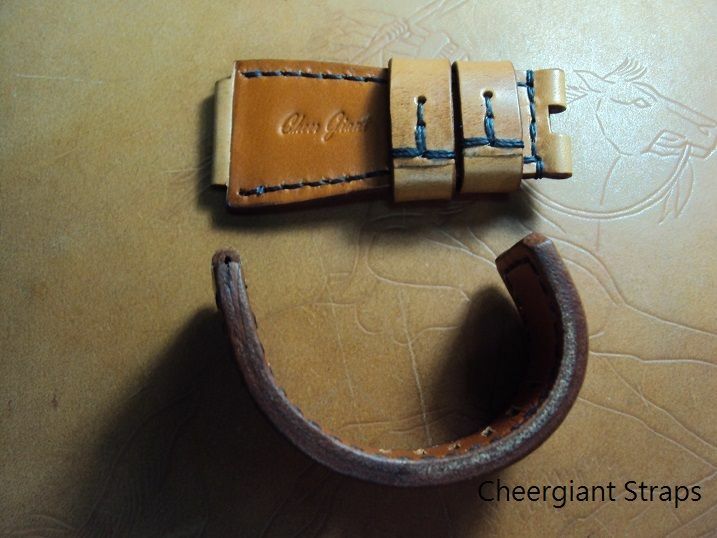 We pare the calf leather to be a curved board pad to produce the padded middle layer of the leather strap. After that, we glue together among the up side cow skin, the middle curved calf board pad and the back side calf lining and sew these three pieces together. 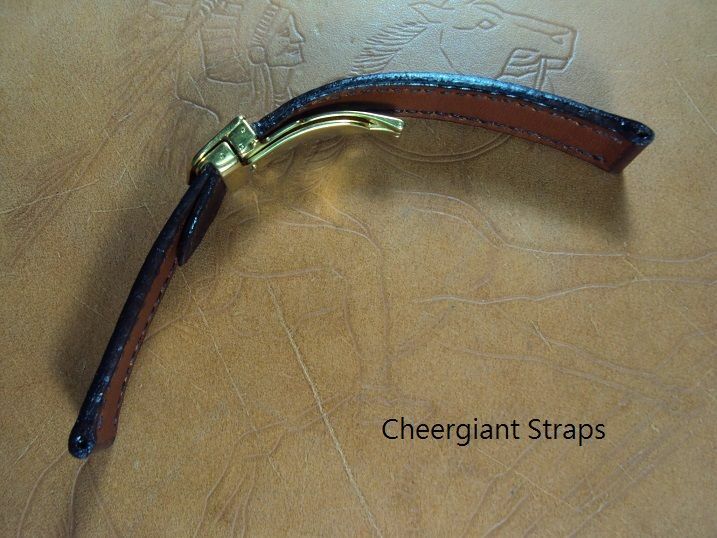 Therefore, our padded leather custom strap will be more durable, clean and anti-allergenic during the wearing period. 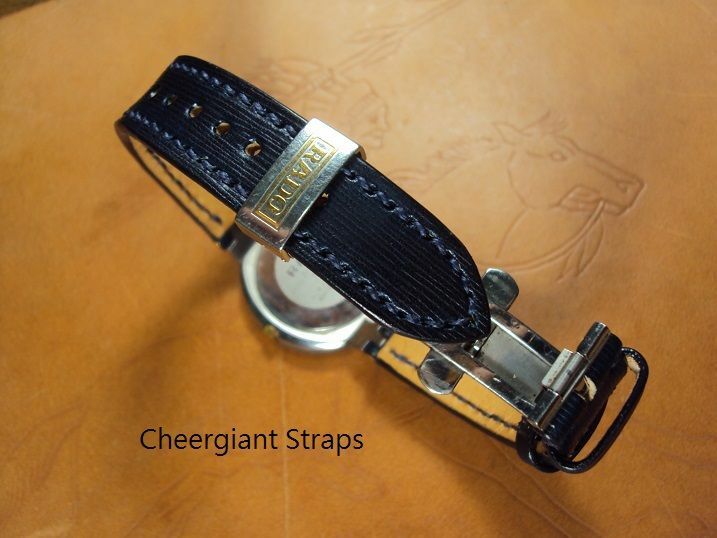 The padded crazy horse strap is priced at $ 150 USD, now charges the promotional price at $ 100 USD including registered airmail worldwide shipping. 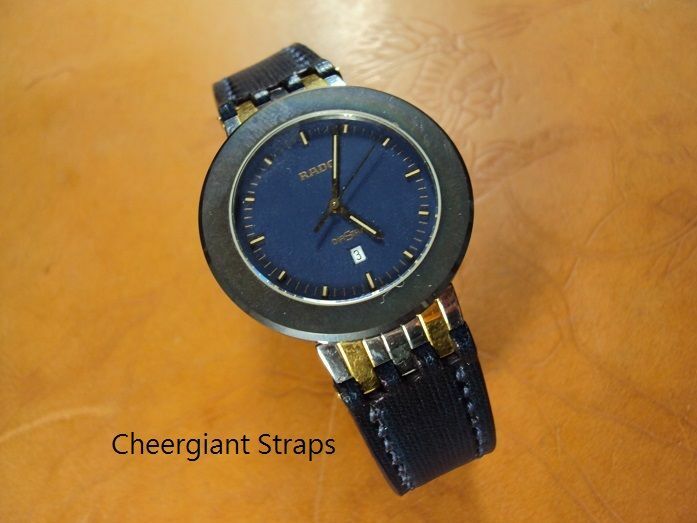 Svw701, RADO DIASTAR deployant clasp dark blue rippled leather strap, 18x16mm, 75x120mm, thick 3.4mm taper to 2.0mm, match stitch. The RADO DIASTAR Italian rippled leather strap is priced at $ 150 USD, now charges the promotional price at $ 100 USD including registered airmail worldwide shipping. 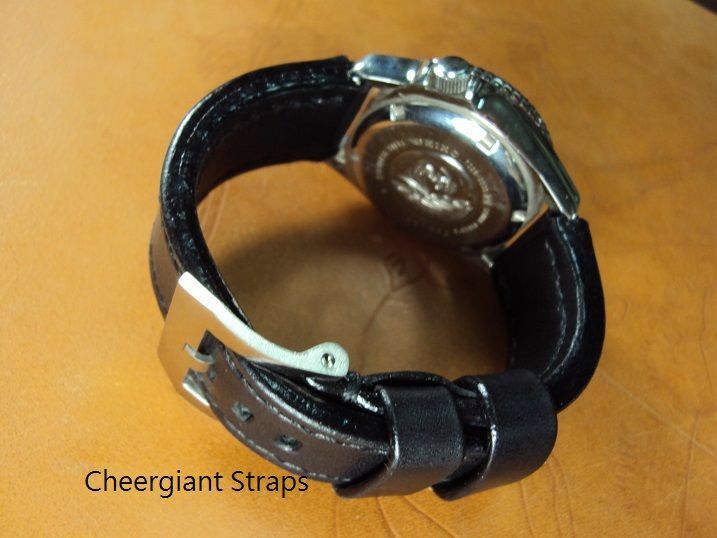 Svw702, Rolex brown Italian ice crack grained leather strap, 22(19)x18mm, 75x115mm, thick 4.5mm taper to 2.6mm, cream stitch. 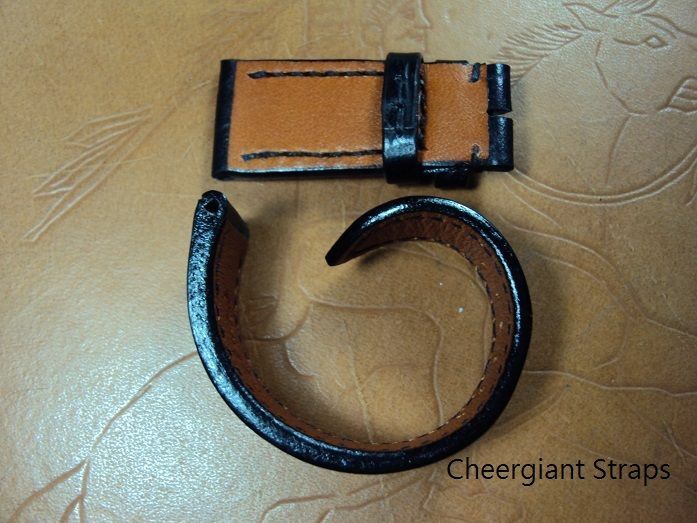 Therefore, you don't have to worry about the damage of the leather rings. 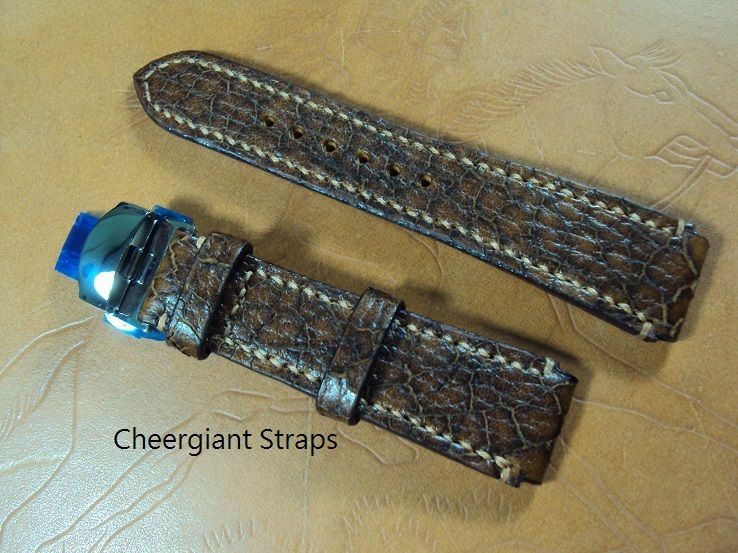 The deployant clasp ice crack grain leather strap is price at $140 USD, it charges the promotional price at $ 90 USD including registered airmail worldwide shipping. 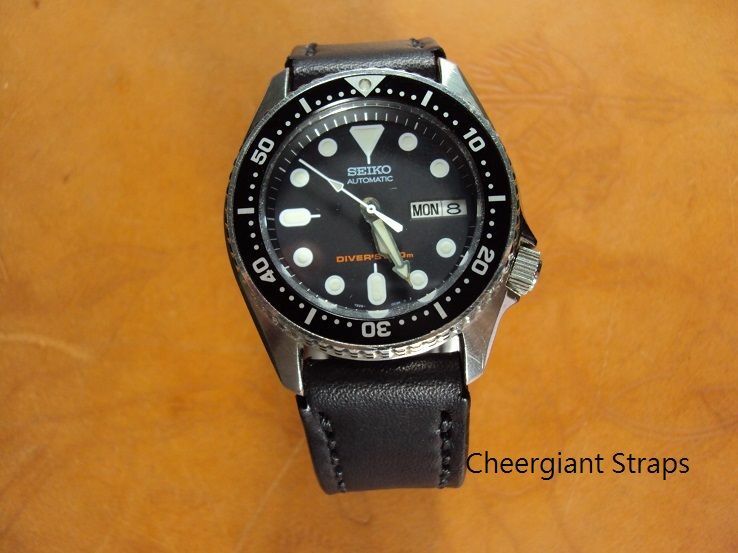 Svw703, SEIKO SCUBA DIVER'S ultrasoft black vintage leather strap, 22(20)x22mm, 75x118mm, thick 5.5mm taper to 3.7mm, black stitch. 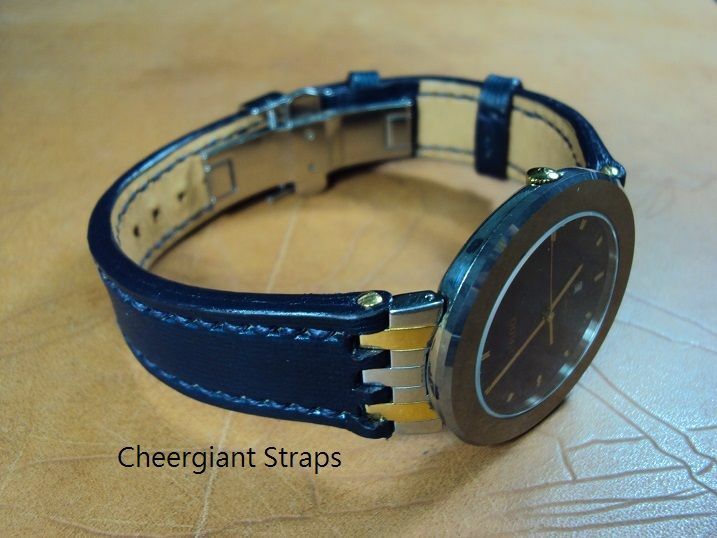 The notch style leather strap is priced at $ 130 USD, it charges the promotional price at $ 80 USD including registered airmail worldwide shipping. No including the replaced buckle which charges extra $15 USD. Svw704, Bell & Ross BR-03-92 tan vintage leather strap, 24x24mm, 75x115mm, thick 4.5mm, black stitch. 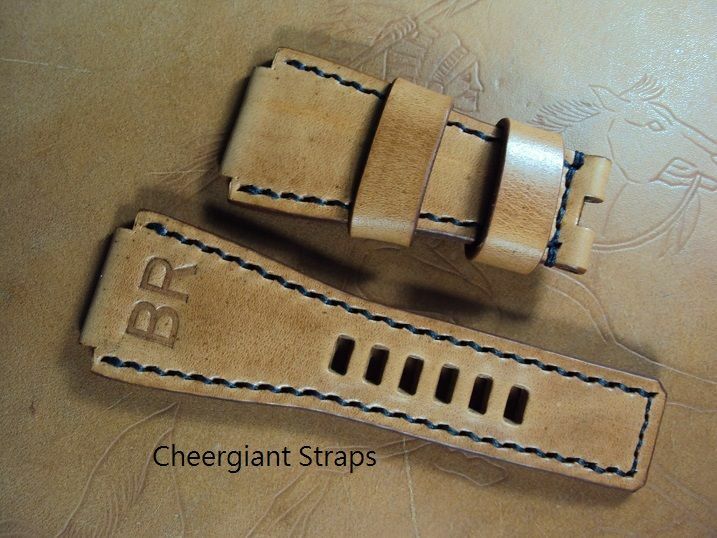 The BR-03 tan vintage leather strap is priced at $ 160 USD, now charges the promotional price at $ 110 USD including registered airmail worldwide shipping. 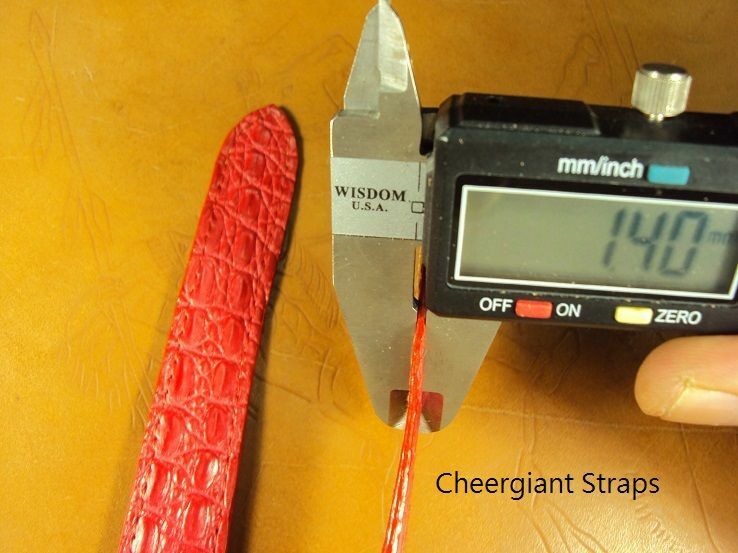 Svw705, Cartier round grained red crocodile strap, 20x18mm, 115x115mm, thick 3.0mm taper to 1.4mm, red stitch. 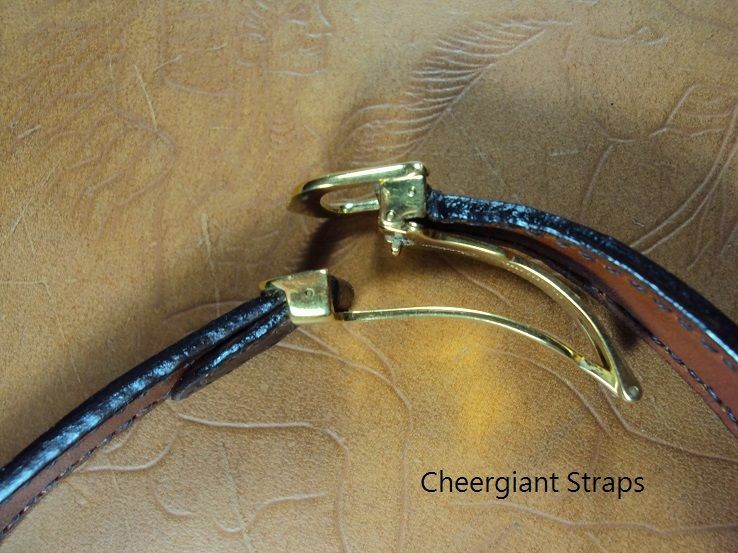 The Cartier deployant clasp crocodile strap is priced at $ 200 USD, now charges the promotional price at $ 150 USD. Shipping for worldwide Express Mail Service please plus extra $ 24 USD. 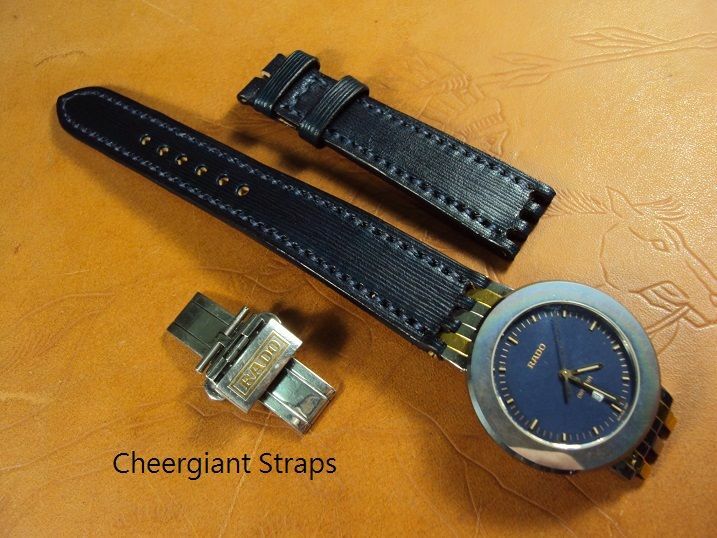 Svw706, Cartier dark brown vintage leather strap, 16x14mm, 82x87mm, thick 2.5mm taper to 1.5mm, match stitch. 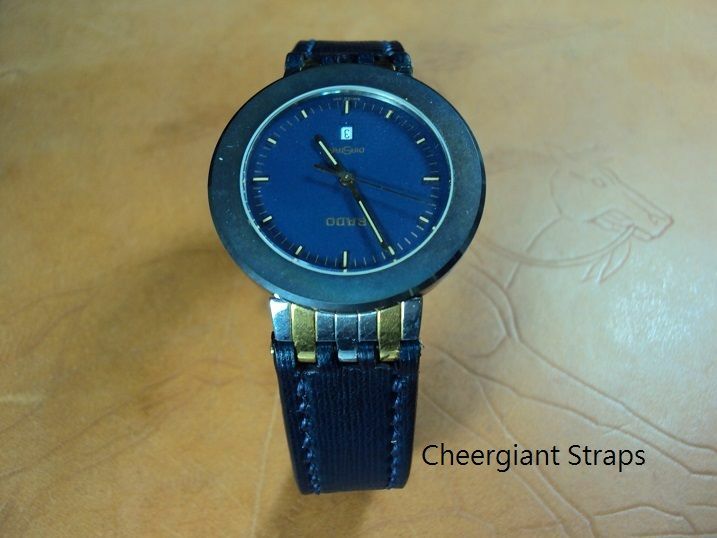 This Cartier deployant clasp leather strap is priced at $ 140 USD, now charges the promotional price at $ 90 USD including registered airmail worldwide shipping. No including the OEM buckle. 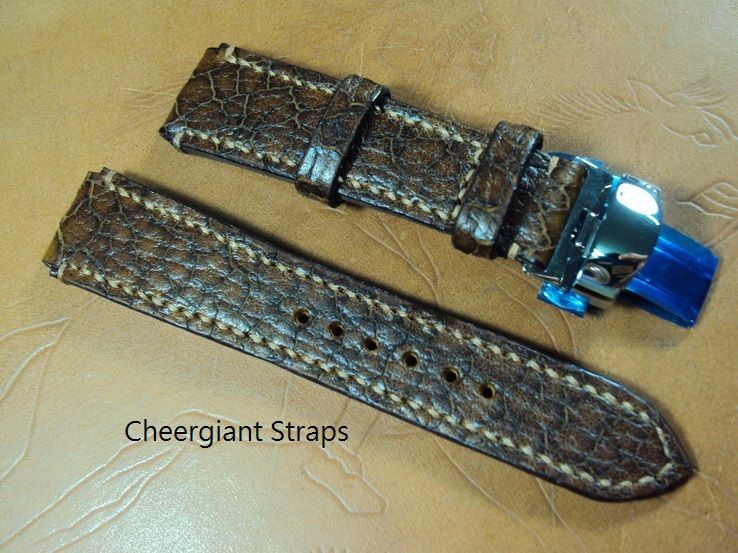 Svw707, Rolex dark brown crocodile belly strap, 20x18mm, 70x122mm, thick 5.0mm taper to 2.7mm, thin match stitch. 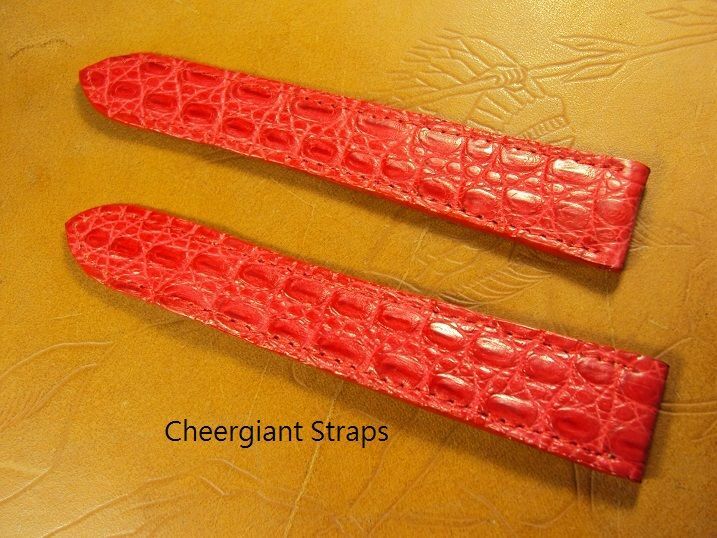 The crocodile belly strap is priced at $ 180 USD, it charges the promotional price at $ 130 USD. Shipping for worldwide Express Mail Service please plus extra $ 24 USD. 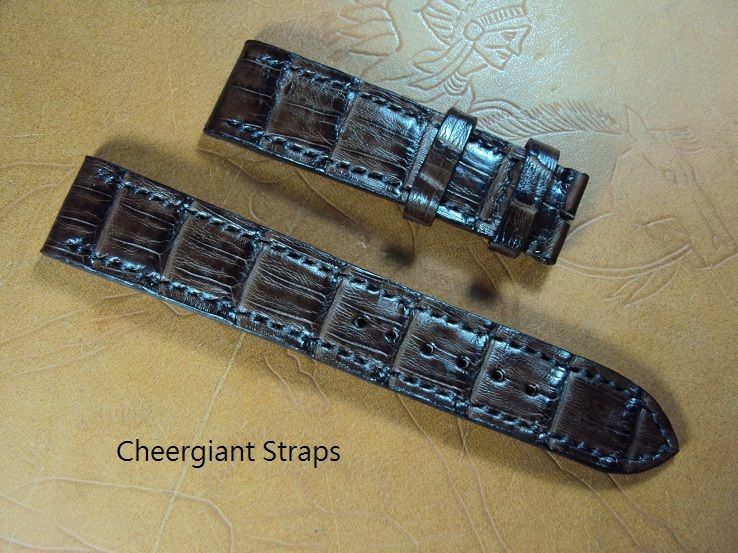 We are glad to exhibit our handmade leather straps here. 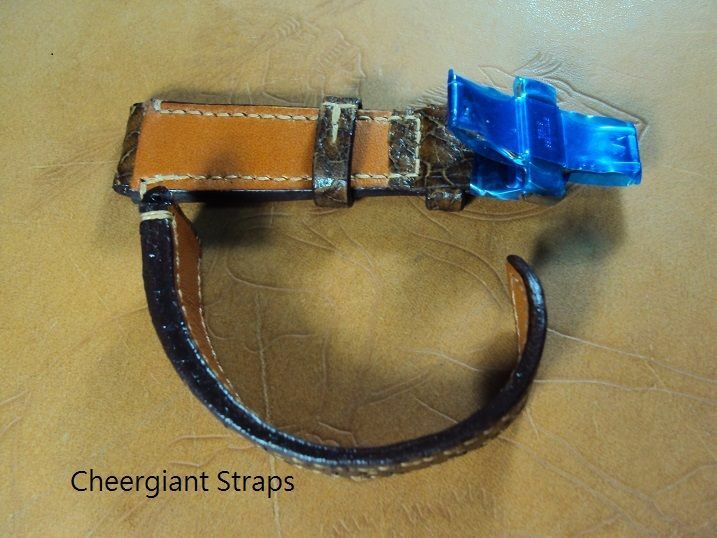 We do our best at hand made leather crafts and we are used to make our leather craft to be an exquisite artwork. 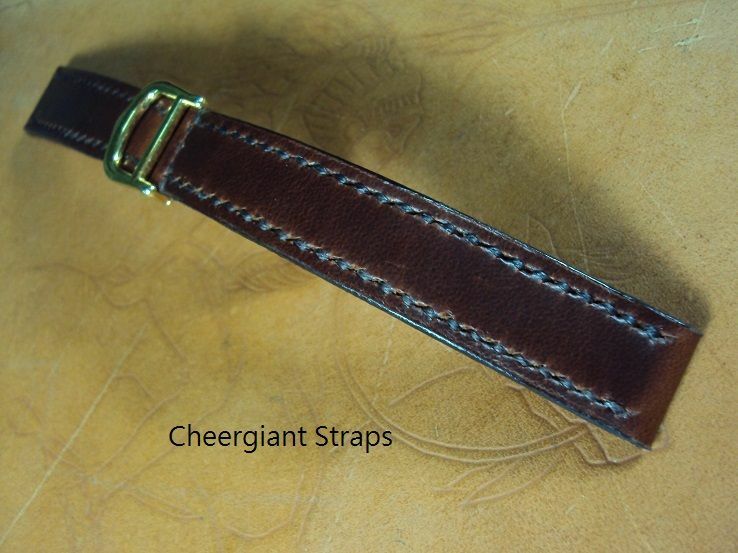 All of my leather straps are completely made by hand, made of some pieces of European cowskins (include the middle calf pad and the reverse side calf lining ), dyed & burnished edges or rough edges, and hand stitched with waxed natural linen thread. 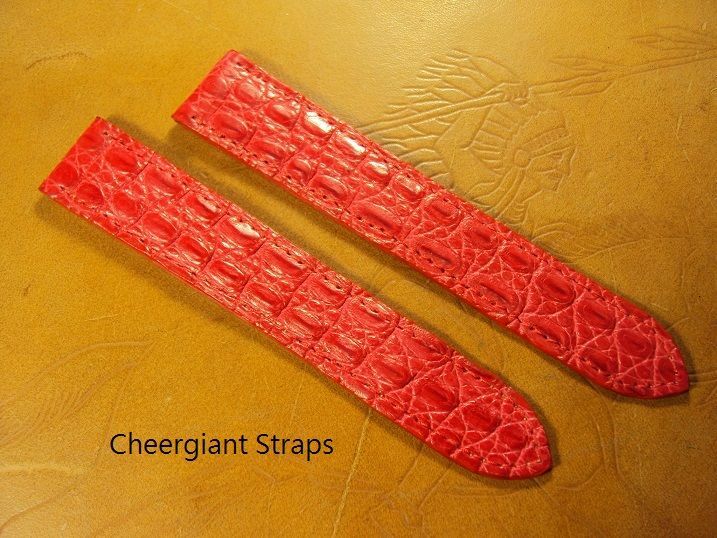 The same producing process of the crocodile strap is that the crocodile skin was instead of the cow leather to make a crocodile strap. 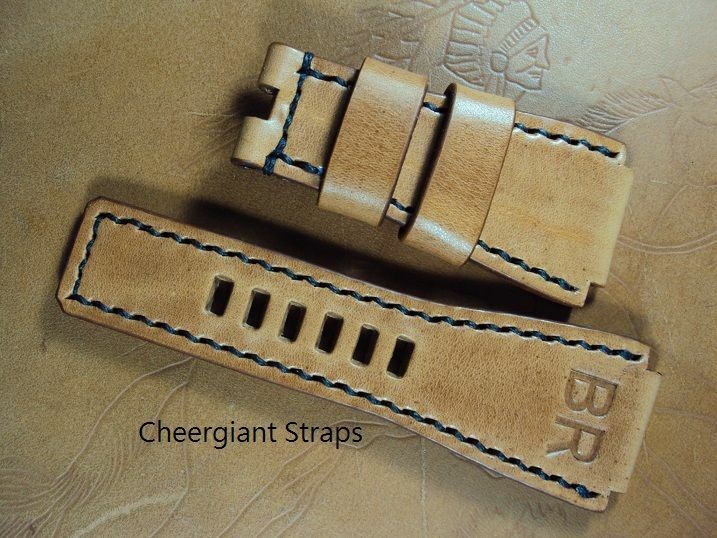 The floating keepers of my custom straps were sewn very nice to avoid falling off.